‘The Small Back Room’ (1949) is a Powell and Pressburger film, made in association with Alexander Korda’s London Films. It has a marvellous pedigree – following on from such Archers’ classics as ‘A Canterbury Tale’ and ‘Black Narcissus’, the latter sharing Kathleen Byron and David Farrar in lead roles. There is a good solid supporting cast too, including Cyril Cusack, Sid James and Jack Hawkins. A noir atmosphere comfortably envelopes the viewer, the film wraps itself around you like a heavy blanket. Then there is the Powell and Pressburger attention to detail, the highlighting of sights, sounds or figures of speech that really make their films come to life. My favourite thing in this film is towards the end, when Farrar’s character has to go and diffuse a bomb on Chesil Bank. The crunching of pebbles and Farrar’s struggle to walk over them, coupled with the wheeling cries of the gulls. This is a moment of bliss, this juxtaposition of the mundane and the tension of a bomb that could blow at any second. This is one fantastic film – so why isn’t it up there with ‘A Canterbury Tale’ or ‘…Colonel Blimp’? Although ‘The Small Back Room’ was critically well received at the time, and the internet is full of appreciative reviews, contemporary audiences didn’t take to it and it flopped at the box office. The reason for this can only be that the subject matter put people off from going to see it. Although filmed in 1949, the story is set in 1943, and the back room in the title references so called “back room boys.” It looks at the scientists involved in the study and development of weaponry. One sub plot covers the discussions around a new gun, while the main story involves Farrar’s character (Rice) tackling a new, unknown bomb that has been appearing at various locations. The serious tone is enhanced further by Rice suffering with his prosthetic foot and battling with the only thing that really helps him to handle the pain – Whisky. It seems that it is this that put people off – guns, bombs, bravery and personal misery. When you’re only just getting over suffering the same thing yourself, the last thing you want to see at the cinema is more of the same. It perhaps shows us an anomalous period in cinema. These days we can’t get enough of the 1940s. We will take any opportunity to commemorate events from this period, and films and books from or covering this era remain popular. When the war itself raged, many films boosted morale by showing the British at their fighting best, whether this be ‘In Which We Serve’ at sea or ‘Millions Like Us’ in the factories. I think that if ‘The Small Back Room’ had actually been released in 1943 it may well have fared a lot better as a dramatic look at how our brave scientists were cleverer than the Nazi ones. But instead, it was released when the wartime adrenaline had stopped pumping, and we were left with piles of rubble and worse rationing than ever. If film was to reference any of this, it had better be aimed at cheering people up. Another 1949 film was ‘Passport to Pimlico’, a story about rationing that delivered a humorous look at why we should continue to put up with it – focusing on the end result. It was just time to look forward and not back for a while. 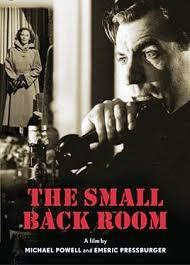 Due to bad timing alone, ‘The Small Back Room’ is a forgotten classic. Please revisit it and give it a little love. Visit my new History Usherette Spin off blog...looking at the acting profession in the 1940s and 1950s including a fictional account entitled "When Britannia Poked Her Trident."